From left, Susan Goldsmith, Chair of the Board JGS Lifecare, Adam Berman, President CJL, Barry Berman, CEO CJL. 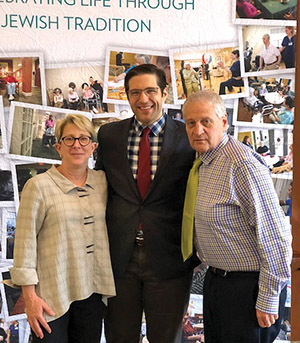 JULY 19, 2018 – Chelsea Jewish Lifecare (CJL), a highly respected leader in senior living with campuses in Chelsea and Peabody, Massachusetts and JGS Lifecare (JGS) a leading healthcare system serving seniors and their families in western Massachusetts, announced their intention to affiliate. The relationship between CJL and JGS has developed over recent years. After Chelsea Jewish opened the award-winning Leonard Florence Center for Living in 2010, the country’s first urban model Green House® skilled nursing facility, JGS consulted with CJL in preparation for the construction of its own Green House® model. The highly acclaimed Sosin Center for Rehabilitation opened in 2016 on the Longmeadow campus. This affiliation is therefore a natural progression of the developing relationship between the two organizations. Once consummated, CJL will manage the daily affairs of JGS in accordance with the direction set by the JGS Board of Directors.